SEPANG (Feb 7, 2013): Brahim’s Holdings Bhd, which has earned global recognition for its capabilities in halal food catering, will leverage on this core competency to jointly venture overseas with its foreign counterparts that want to go halal, said its executive chairman Datuk Ibrahim Ahmad. “After 10 years concentrating on the local market, it’s now time to venture overseas. There are many airline catering companies (out there) that want to go halal,” he told reporters after the renaming of its halal in-flight catering company and the launch the new logo by former prime minister Tun Abdullah Ahmad Badawi here yesterday. Ibrahim said Brahim’s can venture with some of these foreign in-flight caterers by giving assistance and technical support to certify their in-flight kitchens halal. “We are seriously talking to one in China. There are (also) many Middle Eastern airlines. Whenever they (airlines) fly to a certain destination, they need halal food. Some of the destinations do not have halal food. “With the need for halal, our halal excellence centre has certify some of these (LSG) in-flight kitchens to supply halal food,” he added. LSG operates 250 kitchens worldwide. 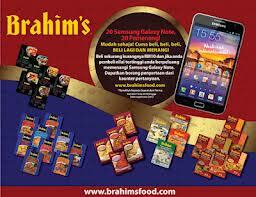 Meanwhile, Brahim’s has embarked on a RM2 million rebranding exercise, following the completion of its acquisition of the remaining 49% in Brahim’s –LSG Sky Chefs Holdings Sdn Bhd (BLSG) from LSG Asia GmbH in January. Brahim’s in-flight catering services are operated out of BLSG’s 70%-owned subsidiary, LSG Sky Chef-Brahim’s Sdn Bhd (LSGB), which Malaysia Airlines (MAS) has a 30% stake. BLSG has been renamed as Brahim’s Airline Catering Holdings Sdn Bhd and LSGB as Brahim’s Airline Catering Sdn Bhd. Ibrahim said Brahim’s Airline Catering currently services over 30 international airlines, including MAS, AirAsia, AirAsia X, Etihad, Cathay Pacific, China Airlines, Japan Airlines, Korean Air, Thai Airways, Emirates Airlines, Garuda and Gulf Air. He added that the company has recently signed with Air France for a three-year contract to provide catering services out of the KL International Airport in Sepang, beginning March. Saya dari Johor. Perniagaan saya adalah Pengekspot Minyak masak yang dilesenkan dengan MPOB. Untuk memasarkan barangan tersebut saya telah melantik wakil pemasaran dari Algeria. Ada pertanyaan untuk barangan halal khusus dari Malaysia untuk beliau pasarkan dirantau sana dan dengan itu saya bercadang untuk memasar barangan keluaran tuan dirantau tersebut. jenis barangan yang boleh dipasarkan.